(Nanowerk News) A group of researchers from University College London (UCL) have created an iphone game as part of their entry for the Royal Society's Summer Science Exhibition. The exhibition showcases cutting-edge research and is part of a wider festival of science to mark the Society's 350th anniversary. The team from the London Centre for Nanotechnology, UCL Chemistry and UCL Physics & Astronomy created the game as part of their exhibit about the mysteries of water. They worked with a software development company to design Waterfall, an iphone application which teaches players about ice and nanoscience. Waterfall is part of 'A Molecule's Eye View Of Water', their exhibit examining the properties of water at the nanoscale through simple demonstrations, videos, games, and interactive computer simulations. The ice caps are melting, you have to rebuild them one water molecule at a time. Waterfall is a simple, fun, and highly addictive game that teaches you about ice and nanoscience. Professor Angelos Michaelides (London Centre for Nanotechnology and UCL Chemistry) said: "We wanted to make a game that was both fun to play and taught the player some of the basic principles about the structure of ice. "To do this we teamed up with the Koolistov software development company and developed a fun game in which the user builds an ice crystal out of individual water molecules. "Although water ice is a common everyday material, water molecules are arranged inside ice crystals in a surprisingly complex manner. 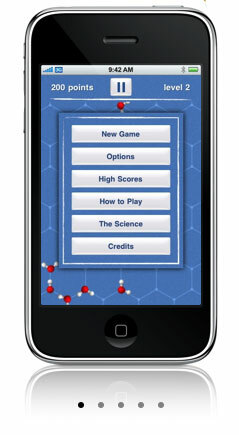 This game teaches people some of the basic 'rules' of how water molecules are arranged in ice crystals. "During the 10 days of the exhibition we will run a competition and award prizes to the people who get the best scores in the game." Visitors to the exhibit will also get access to the country's biggest supercomputer and be able to run simulations on it while at the stand. They will also be able to enter their scores on Waterfall in a competition to win a trip for two to the famous Icehotel in Swedish Lapland. Professor Angelos Michaelides and his colleagues are members of the Thomas Young Centre, an intercollegiate partnership involving UCL, King's College London and Imperial College London. UCL researchers are also behind a second exhibit, 'Nanoscale Science: A Giant Leap For Mankind'. A team from UCL, the Davy Faraday Research Laboratory and The Royal Institution of Great Britain are exploring how nanotechnology – the science of the very small – is transforming healthcare. The team is focusing on two specific particles – gold nanoparticles, which can be used in pregnancy tests, blood sugar monitoring and anti-cancer therapy, and magnetic colloids, which are used as MRI contrast agents and have great potential for anti-cancer therapy and drug delivery. "Nanotechnology offers scientists novel applications in the field of biomedical sciences, and we are focussing on harnessing this potential to advance healthcare diagnostics and therapeutics, including localised therapy for cancer treatment," said Dr Nguyen Thi Kim Thanh, who holds the Royal Society University Research Fellowship and UCL-RI Readership in Nanotechnology at the Davy-Faraday Research Laboratory. Visitors to the exhibit will see nanoparticles in action and take part in making them, using cooking ingredients such as lemon juice, salt and eggs. Scientists will demonstrate colour changes in nanoparticles, and how heating magnetic nanoparticles on human tissue can provide powerful localised therapy for cancer. To download Waterfall or find out more information about 'A Molecule's Eye View Of Water' and 'Nanoscale science: A Giant Leap For Mankind' follow the links above. The Royal Society's Summer Science Exhibition takes place at the Southbank Centre in London from 25 June to 4 July.